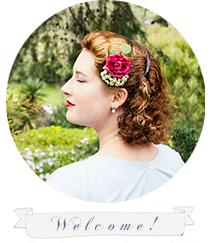 The story behind this DIY is that I was looking in vain for a tutorial on how to make a fabulous 1940’s felt brooch like the ones I’d seen floating around. When that proved to be impossible, I decide to take my inspiration from a lovely vintage felt flower corsage, and make up my own pattern. Let’s get started shall we? Step One: Cut out the stems for the flowers, fold a stem in half and sew the sides together. You can use running stitch here, but I preferred to use blanket stitch to allow the stem to look more rounded. Repeat twice to create 3 stems. Step Two: Cut out the length of stamen felt, and create the stamens by cutting into the side of the rectangle, around two thirds of the way deep. Then continue making cuts down the side to create a ‘fringe’. Repeat twice to create 3 stamens. Step Three: Roll up the stamen strip and sew through the bottom end to secure it. Repeat twice to create 3 stamen rolls. Step Four: Sew the stamens to the top of your stems. Repeat twice to create 3 stamens & stems. Step Five: Cut out three sets of petals. Step Six: Wrap a petal strip around a stamen & stem. When you are happy with how it looks, use a couple of pins poked in crosswise to hold the petals in place while you sew them down. Repeat twice to create 3 roses. Step Seven: Cut out a rose hip circle, and snip little Vs all around the edge. Repeat twice to create 3 rose hip circles. Step Eight: Fold the rose hip circle in half, and in half again so that you end up with a little triangle. Very carefully cut off a small amount of the triangle tip to make a small hole in the centre of the circle. Thread the circle on the stem up underneath the flower petals. Repeat twice. Step Nine: Secure the rose hip circle to the flower with pins, then sew it down to the flower near the top of the zig-zag cuts. Repeat twice to create 3 complete felt roses. Step Ten: Cut out the rose leaves and attach them to the back of the flowers, placing them according to taste. Step Eleven: Group the roses in a bunch, and secure with a pin through the stems before sewing them together. Step Twelve: Attach a bow. This can be ribbon, a small strand of felt tied in a bow, or a pieced felt bow like I did. The instructions for the pieced felt bow are listed down below, and there is a template for the felt pieces too. Make up the bow, and then come back to finish off the corsage. Step Thirteen: Secure a pin to the back of your corsage, or a brooch finding. Sew a small piece of felt over the back of the pin or brooch finding. This will help to stabilize the flowers. You can skip this step if you want to. Top Tip: If the flowers still aren’t as stable as you would like, add some small stitches and sew the flower heads together. The flower corsage will be floppy because of the soft stems, however, and that’s ok. It will be fine while you wear it! Step One: Cut out three strips of felt in the sizes you want. Step Two: Fold the main bow strip back on itself to created two loops, one on either end, and sew in place. Step Three: Wrap the middle length of felt around the centre of the bow, covering up where the bow loops are joined. Sew down, and cut off any excess. Step Four: Fold the tail strip of felt in half, on a angle, and secure. You can snip the ends of the felt to make them pointed. Step Five: Sew the finished bow onto your corsage. I hope you enjoyed this tutorial and have fun making your own felt flower corsage. If you have any questions about anything at all, please don’t hesitate to ask and I’ll do my best to help out. All templates and instructions copyright to BJVear Studio. Available for personal use only, no commercial rights allowed. Totally love this! I'm going to have to try it! So adorable! I will definitely give this a go soon! :) Thanks for the tutorial, dear! Hurrah! Thank you for this tutorial, I will definitely be giving this a go! So cute! And you make it seem so easy. I must try this sometime soon, I think even I could manage. This is so tremendously lovely and creative. I really adore how incredibly easy to follow your instructions are, aided all the more by this great set of step-by-step photos. I must get some felt and give this a spin now, too! Oh, I hope you do Jessica! I'm glad it seems to be easy; I knew I couldn't do it without the photos and the text though... Sometimes that picture really is worth a thousand words! This is so cute! Thanks a million for sharing the tutorial! Now I just need to go conjure up my felt scraps to make one! It really is a gorgeous brooch and you've done a great job with the tutorial!